Invite only – Knight Dragon presents its vision for a new creative destination at the heart of Greenwich Peninsula, designed by an ensemble of eight dynamic architects. Richard Margree of Knight Dragon will reveal this exciting initiative, and will be joined by John Kampfner of Creative Industries Federation, and Kirsten Dunne of Greater London Authority, to discuss the importance of keeping London creative. 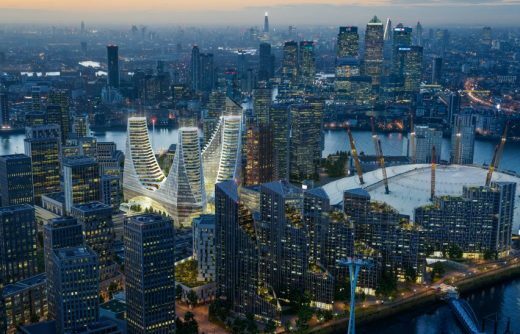 Peninsula Place, part of the Greenwich Peninsula redevelopment, is a billion pound landmark building, designed by architect, artist, and engineer, Santiago Calatrava. 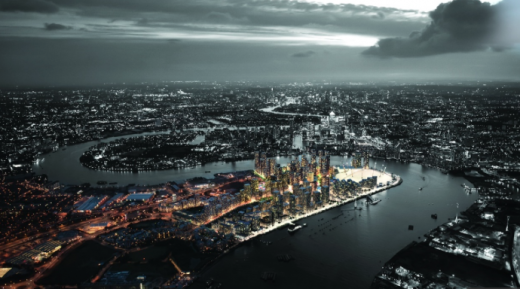 The ongoing regeneration of south-east London’s Greenwich Peninsula is a £1 billion project. e-architect reported on this at the end of January, but new images have now been revealed. Peninsula Place is an £1bn investment, 1 million sq ft of shops, bars, theatres, cinemas, performance spaces, apartments and hotels. There are three towers, each rising to 40 storeys, plus an 80ft high canopy. 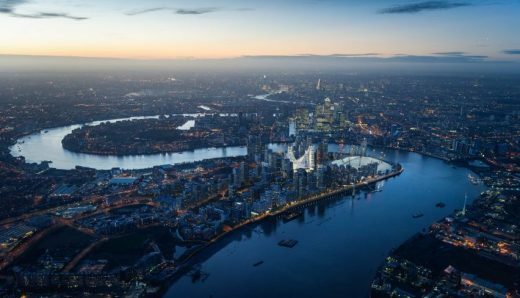 The Spanish architect revealed the scheme at a special launch event on 2 February, alongside London Mayor Sadiq Khan, Peter Murray of NLA, and Richard Margree and Sammy Lee from developers Knight Dragon. The conference took place in the Now Gallery, which is part of the Gateway Pavilions, reports archinect. The space, which is on the doorstep of North Greenwich tube station, was designed by Marks Barfield, and is (as described by Margree) “a deliberate statement of intent by Knight Dragon as to what we wanted to do here, and the quality that we will bring.” This initial building – the literal and metaphorical gateway – is one which will set the tone for the development. 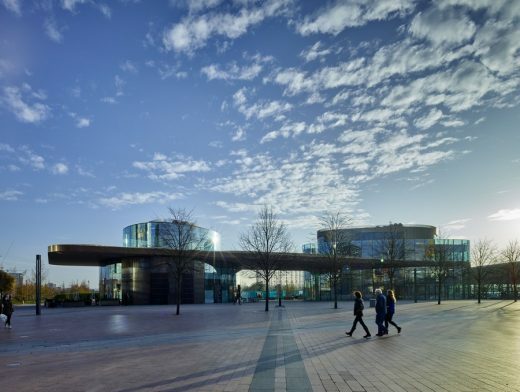 Knight Dragon’s overarching aim for the 150 acre site is to become an attractive and thriving community of seven neighbourhoods, and is why the team approached Santiago Calatrava almost two years ago to create something iconic for it’s landmark building. 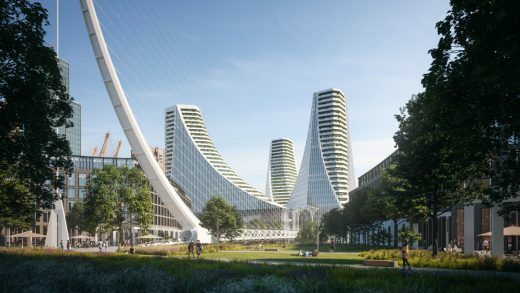 The design of Peninsula Place is a manifestation of “form perfectly match[ing] function”, as Calatrava sought to understand and celebrate this “critically important space in London”. According to greenwichpeninsula.co.uk, “The spirit of the new Peninsula neighbourhoods encourages artistry and originality whenever possible. 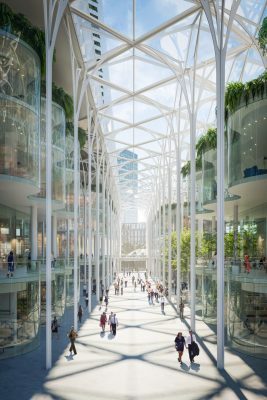 That’s why talks about Peninsula Place have been happening for over a year with one of the world’s most original, artistic and challenging architects, Santiago Calatrava. The creation of Peninsula Place will be his first ever piece of architecture in Britain. 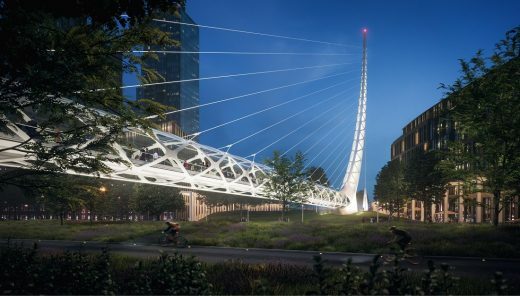 A land bridge, which will connect the main Galleria space and the Meridian Square public park, is very much an integral part of Santiago Calatrava’s 1.4 million sq ft design. Connecting the riverfront to the building via a public park creates a journey, and aims to attract the public from a large radius to the cultural hub. Peninsula Place responds to its natural surroundings, its unique position, the history of Greenwich, the Meridian and to Calatrava’s love of British engineering. He explains ‘we are creating in the minds of people a place, an arrival, not just a traditional space. Everywhere there are elements that can create an identity – parks, the meridian line, an arcade and winter garden. Standing in a cathedral-sized space savouring a moment under sun-streaming glass needs to be experienced rather than read about. But delving into Calatrava’s influences is fascinating. 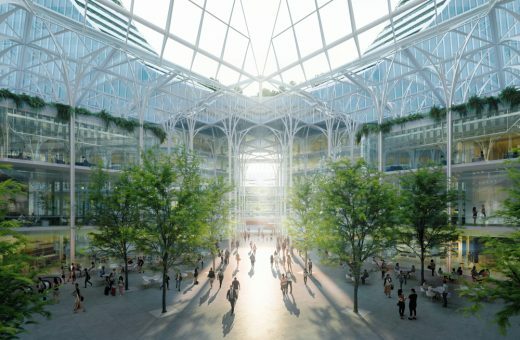 Emerging from the tube into the winter garden you find an urban forest – real trees beneath a glass canopy that unfolds to let in the air and weather – leading to a galleria of pavement cafes and shops. And in a hymn to the ancient orchards that grew on the Peninsula, slender columns create an ‘avenue of trees’, their branch-like crowns supporting the monumental glass canopy. Of course Greenwich is famous as the beginning of the Meridian, so Peninsula Place’s bridge to the river has a mast and cable casting a shadow like a giant sundial. It marks time as Greenwich has always marked time. The architecture, engineering and tradition of London and Britain permeate the design of Peninsula Place. You’ll discover references to iconic stations with vaulted roofs and expressed structural elements. You’ll find echoes of London’s grand gallerias such as Burlington Arcade and Leadenhall Market. September 6, 2017 in London.